Wangari Maathai, the first environmentalist to win a Nobel Peace Prize, will be honored at Tuesday’s COP15 opening ceremony as a Messenger of Peace with special focus on the environment and climate change, raising the stakes for Reducing Emissions from Deforestation and Degradation in developing Countries (REDD) within the climate change agreement by putting a human face on the efforts to fund carbon trapping forestry programs in developing countries. Talks have stalled over developed countries’ reluctance to commit to a financial package for developing countries and the lack of a commitment to sufficient CO2 reduction targets. According to the UN, “Ms. Maathai has emerged as a symbol of unity among several climate change campaigns, including Tck Tck Tck Copenhagen, Hopenhagen, and Seal the Deal.” Through the work of the Green Belt Movement, which she founded in 1977, she is responsible for planting over 40 million trees across Africa. Her forest advocacy extends beyond her native Kenya with her service as the Goodwill ambassador for the Congo Forest, the second largest tropical rainforest in the world. 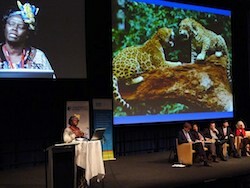 Speaking on two panels at the COP15 parallel event Forest Day 3, held on Sunday at the Copenhagen Radisson Falconer Hotel, Professor Maathai expressed strong support for REDD+. It includes conservation, sustainable forest management, and stock enhancement—defining aspects of the Green Belt Movement’s work—and was the most popular position at the close of Forest Day 3, according to the side event’s 1600 registered participants. Among those speaking were UNFCCC Executive Secretary Yvo de Boer; Denmark’s Minister for the Environment; Rajendra Pachauri, Chairman of the IPCC; Gro Harlem Bruntland, United Nations Special Envoy on Climate Change, and Nobel Prize winner Elinor Ostrom. The timing of Forest Day 3 allowed for many delegates and Ministers of the Environment from various countries to attend, despite its location outside the Bella Center where the formal negotiations are taking place. Ms. Maathai believes REDD efforts can be funded, verified, monitored and enforced based on 40 years of community-based forestry and cooperation with international partners. Ms. Maathai attributes the Green Belt Movement’s success in poverty eradication, job creation, and aforestation to paying women growers a small amount for only the trees that survive. A grassroots example, she believes the success of the Green Belt Movement shows the potential for investment-worthy projects across forested regions of the developing world. Flanked by the African Development Bank and Congo Basin Forest Fund co-chair Paul Martin, Ms Maathai said Monday, “Money is not the problem.” Throughout the week, she has described the problem as one of world leaders not listening. “If they don’t listen, they don’t listen at their own peril.” The Congo Basin Forest Fund was set up in 2008 by the UK and Norway to protect the world’s second largest tropical rain forest. Wangari Maathai, the first environmentalist to win a Nobel Peace Prize, was honored at last Tuesday’s COP15 opening ceremony as a United Nations Messenger of Peace with special focus on the environment and climate change, raising the stakes for Reducing Emissions from Deforestation and Degradation in developing Countries (REDD) within the climate change agreement by putting a human face on the efforts to fund carbon trapping forestry programs in developing countries. Talks have stalled over developed countries’ reluctance to commit to a financial package for developing countries and the lack of a commitment to sufficient CO2 reduction targets. Speaking on two panels at the COP15 parallel event Forest Day 3, held on Sunday, December 13 at the Copenhagen Radisson Falconer Hotel, Professor Maathai expressed strong support for REDD+. It includes conservation, sustainable forest management, and stock enhancement—defining aspects of the Green Belt Movement’s work—and was the most popular position at the close of Forest Day 3, according to the side event’s 1600 registered participants. Among those speaking were UNFCCC Executive Secretary Yvo de Boer; Denmark’s Minister for the Environment; Rajendra Pachauri, Chairman of the IPCC; Gro Harlem Bruntland, United Nations Special Envoy on Climate Change, and Nobel Prize winner Elinor Ostrom. The timing of Forest Day 3 allowed for many delegates and Ministers of the Environment from various countries to attend, despite its location outside the Bella Center where the formal negotiations are taking place.